Earlier this week, fellow Hack a Day-er [Mike Nathan] reviewed Adafruit’s new iPhone/iPad app Circuit Playground. The comments on [Mike]’s review turned to suggesting ElectroDroid as an alternative to Circuit Playground. Surprisingly, Hack a Day authors actually pay attention to the comments, so I’ve decided to throw my hat into the ring and offer up my review of ElectroDroid. For purposes of full disclosure, I have to add that I paid the $2.59 donation for a copy of ElectroDroid without ads, and have had no contact with the developers. From the opening screen, I was presented with three tabs labeled “Calculators,” “Pin-out,” and “Resources” with a nearly innumerable amount of options beneath each tab. Compared with Circuit Playground, there are far too many options available to fully review in the short format of a blog post. I’ll try to hit the highlights as I go through each tab. 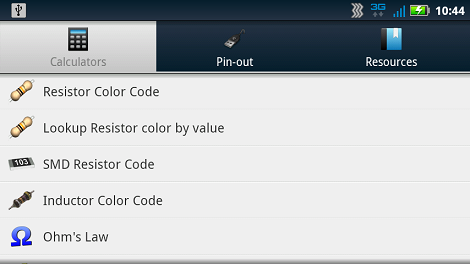 Of course ElectroDroid allows you to calculate the value of resistors from the color code and back again, and will give you a resistor value from an SMD resistor code. Interestingly, I couldn’t find a calculator to go from a resistor value to an SMD resistor code. While there is a table in the app to allow a value to SMD code conversion, I’d like to see that implemented as something a little more interactive. 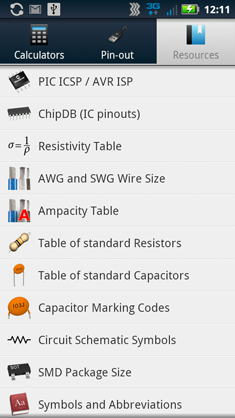 Other calculators include inductor color codes, Ohm’s law, filters, voltage dividers, and everything else listed on the ElectroDroid website. As for the series/parallel resistor calculator, ElectroDroid differs somewhat from what [Mike] saw with Circuit Playground. Like every resistor calculator ever, you’re able to enter a desired value and have ElectroDroid pick out two resistors in the E6 through E192 series that when soldered together will match the desired value. 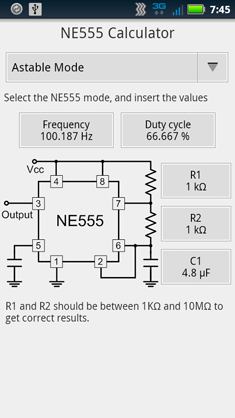 Also, you can enter the value of two resistors and get the resulting parallel or serial value. Unlike Circuit Playground which allows 9 resistors to be placed in either a serial or parallel setup, ElectroDroid limits the user to two. I’m thinking ElectroDroid is a little more representative of reality (why, exactly, would you ever have nine resistors wired in parallel beyond Physics 102 homework? 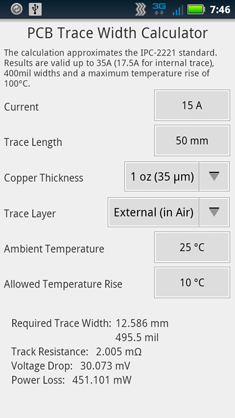 ), but the option to calculate the value of more than two resistors would be nice. The second tab on ElectroDroid goes to a list of pinouts for all the common connectors one would expect to see on a daily basis. All the regulars are there – USB, serial (both DE9 and DB25 – a nice touch), parallel port, Ethernet, and every video connector I’ve ever seen. 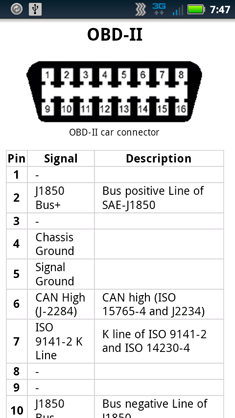 There are also some uncommon but vitally important diagrams for 25-pair phone cable and OBD-II automotive diagnostic system. This is a tough category to review. It’s easy to complain that there are no pin-outs for Super Nintendo controllers, or the ADB or 25-pin SCSI ports found on my old Macs. For me to deduct points for not including extremely esoteric connectors would be wrong; ElectroDroid does a very good job of including pin-outs 99% of makers or builders would need. Here, ElectroDroid serves its purpose. Under the resources tab, I was greeted with a 19-item list of stuff I should have already memorized. 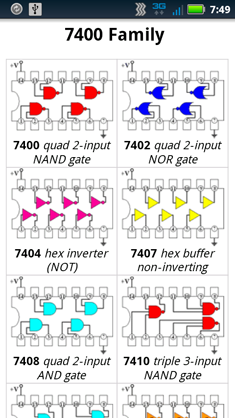 The connections for PIC and AVR programmers are featured in the first position, followed by tables of standard resistors, capacitors, schematic symbols, switch diagrams (SPST, DPDT, etc), Boolean logic symbols, and a very nice reference image for 78xx voltage regulator pin-outs. The Resources tab includes a link to ChipDB, a website I have admittedly never heard about. This is a welcome feature for anyone who is looking for the pin-outs for the entire 40xx and 74xx logic family, but ChipDB only includes 311 entries in its database as of this writing. I can’t fault the ElectroDroid developer for the incompleteness of this database (it’s not even his), but I’d like to see more entries under this link. When reviewing an app, or any reference work for that matter, there needs to be a distinction between what it is and what it can be. ElectroDroid is a fabulous tool and reference app that would be very much appreciated by 99% of the people sending projects into Hack a Day. If I judge ElectroDroid on what it can be, I’m left a little bit empty. Like Adafruit’s Circuit Playground, I’d love to see the ability to take a picture of a resistor and have the app display the value. A ‘killer app’ for electronic reference tools would be a front end for alldatasheet.com that includes the ability to search, save, and display the datasheet for any imaginable component. These are all nit-picking, pie-in-the-sky ideas, though, that don’t affect my impression of the app at all. ElectroDroid is more than worth the $2.59 price tag; while it may not be extremely useful for the analog gurus or those who can build computers out of bailing wire, it’s far more than sufficient for a tinkerer or maker who needs the occasional reference tool. Addendum: Because getting screen shots off of an Android device is insane, I’d also like to add a recommendation for MyPhoneExplorer. It works. great review again HaD folks – nice work. this is why we have a link to this app on our own app page as well. I currently use EE Toolkit on the iPhone. It’s jam packed with calculators and they have updated several times since I bought it. The visuals of EE Toolkit are a LOT busy though, so I’d prefer something a little more small-iPhone-screen friendly. hey brett! thanks – i have that one too! agree with you! we’ll have many many updates, more calcs and features while always keeping the interface clean! love this app! i’ve surprised that czech language is supported :) nice. great app, had it for quite a while. Yesyes, its cool the first time “Look ma! I payed”, but every single time, its just annoying. Good find! Why any decent engineer would be caught dead with a iCrap device is beyond me. Is it risky to root your Android ? I have been thinking about rooting my HTC Vivid but I don’t want to Brick it.. Depends on the device. Some devices (Samsung Galaxy series) are incredibly hard to brick and not only easy enough to root but are typically the first devices supported by Cyanogenmod (ICS runs fine on the old Galaxy S regardless of what Samsung may say) Others like Motorola phones are harder. Why do you need root though? Out of some 200 apps I have only 1 needs root and that’s my backup program. Love this app had the free one for a while, if i wasn’t a poor student id buy the donation version. 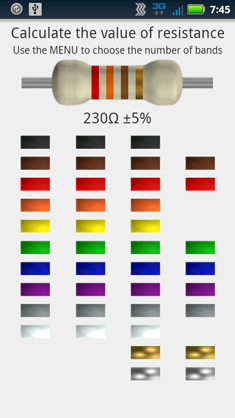 As some one who is very color blind (I have a hard time tell black from brown, brown from red, orange from red, blue from purple [Yeah, I basically can’t see red, its just a dark color for me]), being able to take a picture of a resistor and get its resistance would be really nice. I dropped a small organizer full of resistors the other day, and with no one around figure out the colors for me, and no multimeter handy, I was basically screwed until later that day when I got home. most of this stuff is just captures of existing webpages. I recognise the OBD II image from elsewhere too, i’ve used it myself. Its useful i guess when you don’t have wifi/internet connectivity but it seems like you could build up a better app than any of the current offerings with a few choice web links. That’s simply the pictures used for the reference section. Why take or make his own pictures when there’s already some out there? thats kinda what i’m saying, it exists on the web already. i get the ease of use aspect etc. Theres is also a pic micro controller pinout library for this app called PICmicro Database, comes in quite handy. why, exactly, would you ever have nine resistors wired in parallel beyond Physics 102 homework? Actually, I’ve done 8 in parallel myself, and seen up to 10 in real circuits. The main reason is to spread power dissipation. If you want a 1 ohm resistor that’ll handle two and a half watts of power, it’s usually cheaper to put ten 1/4 watt resistors of 10 ohms apiece in parallel than to find a single 1 ohm resistor with the required power rating. But in this case, the math for computing the parallel resistance is trivial, since all resistors are equal value. One problem with that solution is that the accuracy of 10 resistors in parallel could be far outside of the standard 10 or 20 percent. If they all run towards the upper or lower limit of tolerance, you may not have the resistance value you expect. Just saying – there’s a downside to putting so many together like that even if it is cheaper and easier. It’s all about trade-offs. Actually, when you do the math, you find that 10 resistors in parallel is better, not worse, than 1 resistor of the “right” value. For a concrete example, let’s say we want a 1 ohm resistor, and we’ve got a box of 10 ohm 5% resistors, so we put 10 resistors of 10 ohms apiece in parallel. Worst case, they’re all 5% high or 5% low. The high case, we’ve got 10 resistors of 10.5 ohms, for a parallel resistance of 1.05 ohms, or 5% high. Likewise, if all are 5% low, our final resistance is 5% low. So the worst case is that our final resistance is as bad as the spec for the resistors we used, no worse. But our average case is better, because it’s unlikely that all resistors will be at the limit of their tolerance in the same direction. Furthermore, there’s the issue of temperature coefficient of resistance. By spreading the heat dissipation over multiple resistors, each one of them will heat up less, resulting in less change in resistance due to heating. 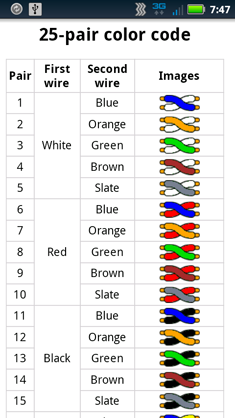 I’m not sure why everyone focuses so closely on resistor color codes. Of all of the electronic things in my head, that was probably one of the easiest to memorize. Give me a pencil and a post-it note and I’ll have the code written down in less than a minute. Just take the first letter of each color and make a sentence out of it. Got to admit, mine would probably get my comment deleted due to it’s adult nature, but it’s very effective. The other parts of the app are much more interesting, imho. website fail – that was supposed to be a regular comment, not a re-reply to the above. Ive been using this app for months now and love it! I too picked up on this from the comment section. Thanks for the recommend OP, great app, glad to see it is getting the attention it deserves! I bought this app a few weeks ago, and it was soo worth it! I recently used it to go through my small resistor collection and properly mark the values on them as I went along. This is such a great tool for the non-iPhone/iPad users. Great review and application. Also thanks for the heads up on “MyPhoneExplorer”. yes, it works and works well. I use ED almost everyday at work. The pinout section alone is worth it’s weight in gold. Through my apprenticeship I’m taking EE classes and the calcs are extremely useful. I’d highly recommend this one to anyone. I’ve been using ElectroDroid for about an year now and it’s a blast! Yeah, I love this app. I have had it for a couple of years. I honestly dont use it often, but it always comes in handy. Especially when not near a computer or you are looking up something you dont do daily. Also, really great for teaching newbs how things work. Every time it updates, its not some some incremental thing either. Usually, updates are big feature chunks, noticeably more calculators, etc. I downloaded it. For the money it’s pretty damned good, has resistor info, chip info, and the thing that amuses me most is the 25 pair phone color coding. Only thing you’d use that for is a 1A2 based phone system or you can use it for networking since it’s all twisted pair. The ElectroDroid app has beta support for plugins, so maybe somebody can add the ability to take a picture of a resistor and get the value. Or the ability to calculate more than 2 resistors in parallel. Great app. I’ve been using it for almost a year. I’m an electronic technician by trade, and this really comes in handy, especially connector pinouts. I rarely ever see a leaded resistor with color codes, since 99.99% of what I do is SMT, but it’s nice to be able to refresh my memory when I do see one. 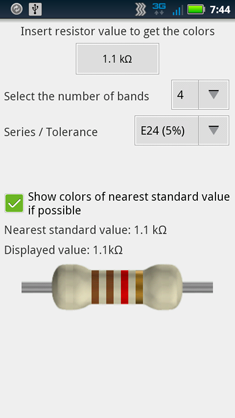 I have heard mixed reviews about this resistor app. It will be interesting to see if it works. If it does it would be well work the few dollars. excellent and very useful well designed app! Great it still have 555 timer reference. Btw, 555 timer should be considered obsolete. Get a 6pin or 8pin PIC. It’s much cheaper (less external parts) and have a lot more functions (PWM, ADC, etc). VERY nice guys! Just stumbled across this after buying a couple of OctoPart cards!